This review first appeared in the January 15, 1993 issue of the North County Blade-Citizen (now North County Times). 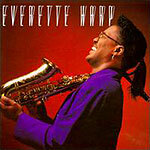 This is a near-perfect pop-jazz album by veteran sideman Everette Harp. Although this is his debut as leader, you'd never guess so from listening. With this, his first recording, Everette Harp has already moved beyond such smooth-jazz icons as Kenny G, David Sanborn and Kirk Whalum with a fresh, innovative style fusing the pleasing sounds of the above artists with a harder, more driving rhythm. If you don't know his name yet, you probably know his sound. The cut "Full Circle" from this album has been all over the airwaves, and Harp backed Anita Baker on her 1988 and '90 tours. Harp has all the ingredients present here needed to go straight to the top: A bright, brassy sound on his saxophone; great hooks in his compositions; and a funky backbeat that makes for full dance floors. He's also got great potential for crossover appeal to the R&B charts with songs such as a remake of "Let's Wait Awhile," Janet Jackson's 1986 hit (in which Harp's horn is backed vocally by the jazz/soul/R&B family act Perri) and "Remember My Love," on which Harp turns in some very strong vocals himself.